The FBI interviewed dozens of people after George Zimmerman shot Trayvon Martin, but none mentioned thinking the killing was racially motivated, according to evidence released on Thursday. Hundreds of pages of documents, including FBI interviews with Zimmerman's friends, co-workers and neighbors, were made public Thursday in the Florida murder case against the now-infamous neighborhood watch volunteer. Zimmerman fatally shot Martin, an unarmed black 17-year-old, in late February. Zimmerman, 28, maintains he feared for his life and shot Martin in self-defense under Florida's "stand your ground law." Sanford, Fla. police did not immediately charge Zimmerman, prompting protests and demands for a federal civil rights investigation. In addition to those close to Zimmerman, the FBI also questioned Sanford detectives working the case, including lead investigator Chris Serino. "Serino believed that Zimmerman's actions were not based on Martin's skin color rather based on his attire, the total circumstances of the encounter and the previous burglary suspects in the community," according to the FBI's notes. Serino and other officers told the FBI that a local gang, referred to in the Sanford community as "Goons," were known to dress in black hoodies. Martin was wearing a black hoody the night of his deadly encounter with Zimmerman. "Serino described Zimmerman as overzealous and as having a 'little hero complex,' but not as a racist," the FBI wrote. The Department of Justice has not filed charges nor made a formal report based on the interviews. The FBI interviews released on Thursday were part of a mound of pretrial discovery records made public by Special Prosecutor Angela Corey. The new evidence also sheds more light on Zimmerman's actions in the weeks after the shooting. According to the documents, an employee of a West Palm Beach gun store contacted the FBI in late March to report Zimmerman had called two weeks earlier to say, "his life is in danger and he needs more guns." Other documents show that Zimmerman had a knife, a pistol and three clips loaded with ammunition in his rental car when he turned himself into the Florida Department of Law Enforcement on April 11, the day Corey announced Zimmerman was being charged with second-degree murder. 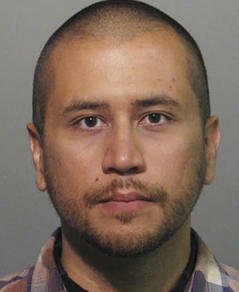 Zimmerman was released from jail last week after posting bail for a second time. His lawyers say he has been the subject of death threats in the racially charged case and is in a safe house being protected by a security team. Thursday's new evidence also included notes from a state investigator's interview with Trayon's close cousin. For months, defense attorneys have claimed it's Zimmerman heard screaming for help during the struggle between Zimmerman and Martin. Their confrontation was recorded on a neighbor's call to 911. But the unidentified cousin believes otherwise. "He said without a doubt 'on a stack of Bibles' that it was Trayvon's voice," the investigator wrote.